You’ve spent a lot of time and money creating unique photo’s for you products. You don’t want others to misuse your images as their own. To prevent others from stealing your work you apply a watermark to your product images. Hower, this takes a lot of time to do manually. Up to several hours per month. From now on you can save time and money with the Lightspeed Automatic Watermarks app for your store. You no longer need to edit your images to apply a watermark every single time. This app makes it easy: just upload a watermark image (or just type text), position it to your liking, and start the synchronisation. From now on product images will automatically be applied with your watermark. From now on you can use our app with Google Shopping and Beslist.nl as well! From our app you can easily generate a custom product feed for Google Shopping and Beslist. These custom feeds contain product images without a watermark. This means the custom feed is Google Shopping and Beslist proof! 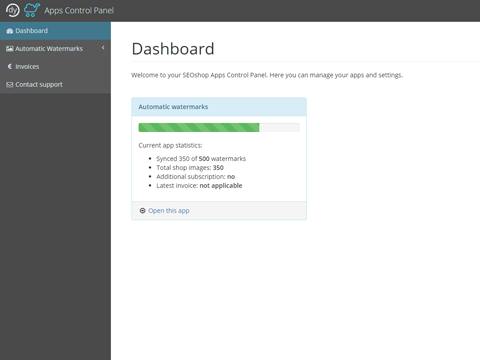 During the installation you create an account which can be used in combination with the Apps Control Panel. This is self-explanatory. If you already have a shop or an account connected to the Apps Control Panel, you can use these login details to connect your current shop to your account. After the installation you'll be redirected to your Apps Control Panel (http://apps.dyvelopment.nl). Here you can manage all your Dyvelopment apps. 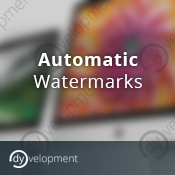 You can add a watermark by going to Automatic Watermarks > Edit in the menu on the left. You can upload an image or enter text, after which you can modify the position and the opacity. After saving your changes you will be shown a live example. After setting your watermark it is time to apply them to your product images. 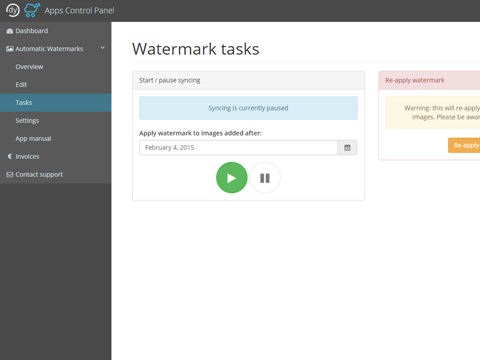 You can supply your images with watermarks by going to Automatic Watermarks > Tasks in the menu on the left. Here you can also specify a date from which the app will start syncing the watermarks. Say you want to apply watermarks to all your current images, you could set this to a date in the far past (default 01-01-2010). If you want to skip images you have previously applied a watermark to manually, you can set this to the date of your preference. For example if you applied a watermark manually for the last time yesterday, you select yesterday's date. If you require more, please do not hesitate to contact us for a custom solution. Note: You can use the images including watermark as long as you use the app. 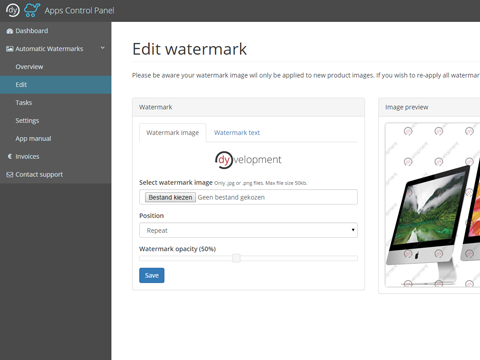 We host your watermark images, save your original images and put them back when you cancel the app. Do you need help? Or do you need support? You can contact us by emailing support@dyvelopment.nl. You will receive a reply as soon as possible.